Morphopolis, by Micro Macro Games and available on Steam now, is a strange game to describe, its part point and click adventure, part puzzle, part discovery and journey but is ultimately a hidden object game. 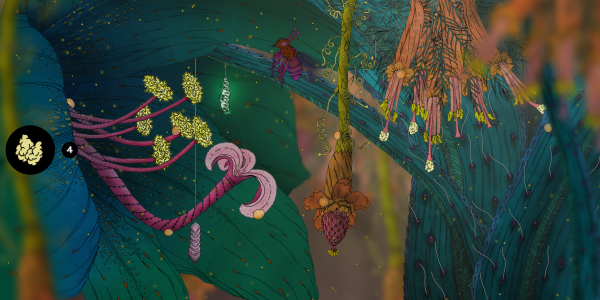 The colours and vividness of the graphics within Morphopolis is visually stunning and extremely eye catching when you first load the game up. You can see why this game has been nominated and won many awards for its visual design. You play as an aphid, starting out in this large and colourful world of ours trying to reunite with your companion, but unfortunately you wouldn’t know any of this as it is not explained at all at the beginning of the game. I only know of this by going to the games website and them telling me this. There is no explanation of any sort at the beginning of the game, no real menu, Level 1 acts as the tutorial, but there are only 5 levels within the game. As you progress through the levels you become bigger and stronger, this is done through you doing tasks for other insects within each level. Most of these tasks are finding a certain amount of an object, as well as the odd puzzle thrown in for good measure. However, like before, you have to figure out what to do in the puzzles as there are no explanations as to what to do, you have to figure it out yourself. When you have completed everything in a level and finished collecting everything you then, for some unknown reason, decide to eat your way into that bigger insect that you were helping, and then become part of that insect. Why you ask?…haven’t a bloody clue. The game itself isn’t too taxing, more frustrating at times in terms of finding out what you have to do, thankfully for the less patient there is a help button. This is time based, so once you have pressed the massive ‘?’ in the corner it will be a good few minutes before it is recharged and ready for use again. 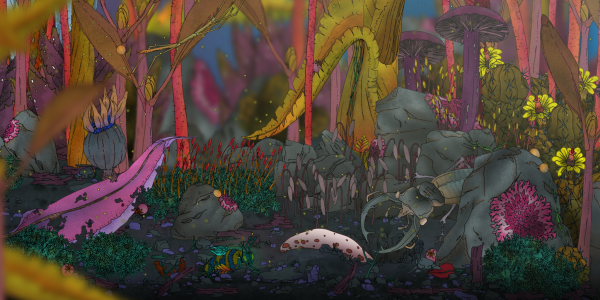 The biggest selling point of Morphopolis is its visuals and it’s obvious to see why. The vibrant oranges and yellows instead of the bland brown and green you would normally see in nature, the depth and detail on each and every insect is a delight to behold. The sound as you are playing the game is more of a relaxed vibe, the game is letting you relax and let you ‘chill’ out when playing. The game is also on both mobile platforms via the Google Play Store and the Apple App Store. The cost is similar on the mobile platforms (around £2.50), but was far higher on Steam (£6.99), this massive difference in cost is a worrying thing for me as a consumer, as there is no actual difference between the games on the platforms. I just don’t see the premise of a game here, it’s more the developers using this as a way to show bigger companies “Look what we can do!”. I feel that they are trying to advertise themselves for future development projects by showing what they can do. It would have been a 4, but for the massive price disparity from Steam to Mobile devices drops it down another point. This entry was posted in Uncategorized and tagged Apple, Google Play, Indie, Micro Macro Games, Morphopolis, Steam, Video Games. Bookmark the permalink.